Jypyä Pop (Turku, Finland) on 19 November 2014 in Plant & Nature and Portfolio. Lovely, looks like a cold and lonely place. @ursulakatariina: The place is on the beach. Yes, the wind is blowing, and sometimes it rains. Definitely a character tree ! A very beautiful composition, nice shadowing. A bit dramatic. Très estampe japonaise, j'aime beaucoup! @Monik: Thank you. This tree is growing in this spot almost a hundred years. It is a great wonder that it has been able to do so. I'm sorry to do a copy and paste today, I have a back problem which only allows me five to ten minutes in front of the PC. I hope it will be better tomorrow. @gerard1948: Not a problem. The machines are sometimes like that. We will meet tomorrow. @Hiro: It grows in very harsh place almost bare rock. I think the age to be close to a hundred years. A natural bonsai. 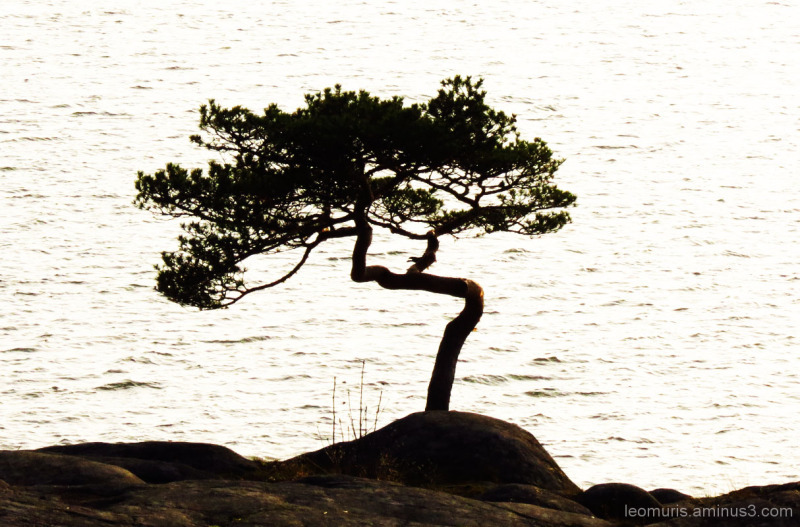 A beautiful photo of this windswept pine. The lonesome pine appears like a sculpture in the landscape. It must be strong to hang on there all alone. @B. Thomas: I think that it is. I believe that it is grown in that at least one hundred years. Very nice set up and camera angle. Good choice of background to accent the tree. This is just lovely! Beautiful light and I love the shape of the pine tree!